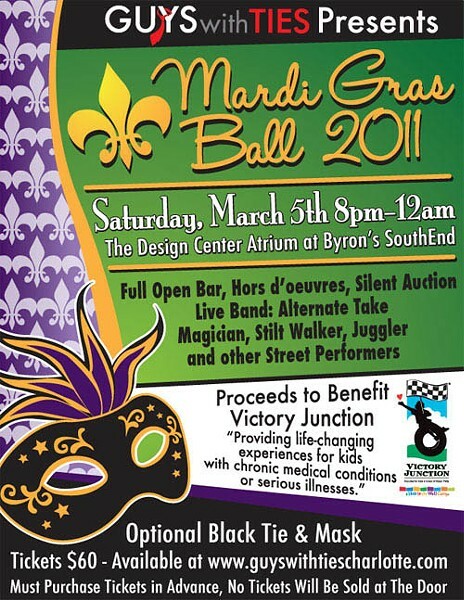 Get your mask and dress to impress for the 2011 Mardi Gras Ball, presented by Guys with Ties. The festivities included an open bar, hors d'oeuvres, a silent auction and live entertainment. Proceeds benefit Victory Junction, an organization helping children with chronic medical conditions or serious illnesses. $60. 8 p.m.-12 a.m. The Design Center, 127 W. Worthington Ave. For more information, visit www.guyswithtiescharlotte.com.